To study the release patterns of protein bovine serum albumin (BSA), porous poly(ε-caprolactone)-chitosan scaffolds with entrapped BSA were fabricated by using supercritical CO2 (scCO2) for its potential use in tissue engineering applications. 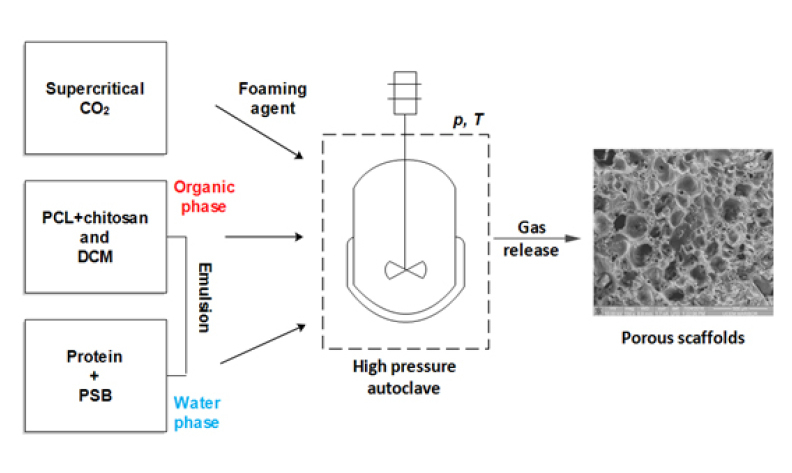 An emulsion, consisting of a polymer-solvent solution and buffer protein solution was saturated with scCO2 at 12 MPa and 37 °C and then rapidly depressurized through a release valve causing bubble nucleation and precipitation of the composite material. The controlled total protein release from biodegradable poly(ε-caprolactone) with 5% chitosan (w/w) scaffolds was assessed by Bradford protein assay. After 16 to 20 days of protein release testing, 58.8% of the protein was released from composite with PCL (Mw=10,000 g/mol) and 43.9% from composite with PCL (Mw=60,000 g/mol). Preliminary studies for characterization of the prepared composite biomaterials using FTIR spectra, ESEM photo analysis and DSC analysis have been carried out.